How Cold is COLD for a Rabbit? Nancy, who lives near Seattle in Washington State, has two pet rabbits which she keeps in a hutch tucked in the "V" corner of two walls of her home. It gets biting cold and snowy at times in Seattle, but places like Spokane WA and the midwest states experience the brutal, sub-zero temperatures for stretches of time, something Seattle almost never sees. 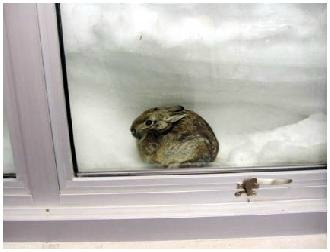 How much cold can a rabbit withstand? Thankfully, a LOT. Rabbits wear their fur coats 365 days a year, and the coats thicken up quite a bit for the winter. The rabbit's coat will not enter its Spring mold until March, and possibly later. Since Nancy's rabbits are covered in a hutch and protected on two sides, they are likely to fare very well even with no extra weathering provided. Cover all the open sides of the outdoor hutch with a tarp, ensuring air circulation but no flapping in the wind. Cover the floor of the cage with 4-6 inches of straw. The hollow straw shafts are excellent insulation for the rabbit. Another option is to place a large cardboard box stuffed full of straw in the cage. Enclose all 6 sides of the box, cutting out an entryway for the rabbit. Create a little tunnel in the straw with your fist. The rabbit will be able to lounge snugly in its cardboard and straw burrow. Moving the rabbit's cage into a shed is also a successful way to beat the cold, if you have this option available to you. "LOVE LOVE LOVE your site! Just finished a blog post and back-linked to several of your pages. Thanks for being such a rich, LOGICAL, dependable source of info." We always appreciate links to Raising-Rabbits.com. 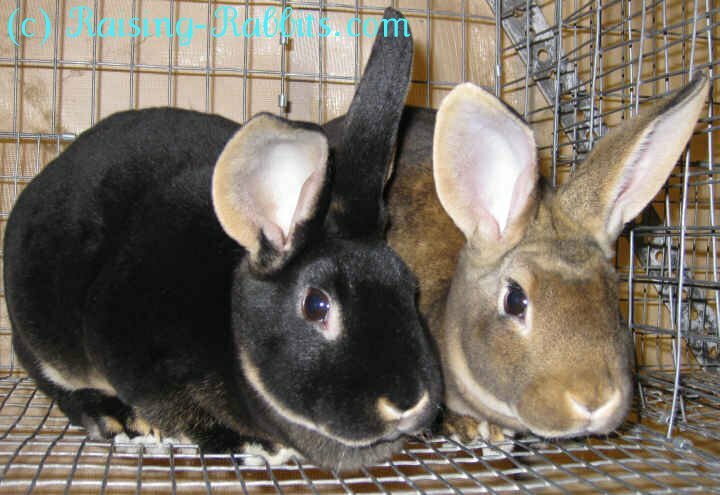 If you also have a website related to your rabbits or your rabbitry, consider placing a link back to Raising-Rabbits.com on your site, if indeed you also consider the rabbit information we provide reliable and logical. Can Rabbits Safely Share a Cage? A common concern with rabbit raising is under which circumstances rabbits can live together in the same space. Naturally, many pet rabbit owners successfully keep multiple neutered house rabbits in the same living spaces. It is when rabbits are not neutered that questions arise. The following are two situations that tend to raise questions, and both of them are addressed at length in Rabbit Raising Problem Solver. Can you leave a sister doe with her pregnant or kindled cage-mate? There isn’t a hard and fast rule for keeping does and their kits together in a cage. Typically, the cage will be too small for both does and litter (or litters), and fighting may ensue. Personalities also play a role. We know of does in large cages that actually did well as each doe clearly understood their relationships to each other to start with. But we’ve also heard the heartbreaking stories of kits all trampled to death because of does chasing recklessly around as they fought with each other. Unless you are very familiar with the two does in question, it is always safest to separate the two does, at least temporarily. Can you introduce a baby buck to an adult buck safely? Introductions of a baby buck, say 5-7 weeks old, to an adult buck might safely be made, but I'd still closely supervise. As one rabbit owner found out, after the introductions, the older buck wanted to incessantly hump the little guy. This isn't dangerous, per se, but it is definitely dominance behavior. In the long term, that baby is going to grow up. Within months, the dominance behavior will devolve into full-blown fighting to the death unless the now-teenage buck is extremely submissive. If your intent is to keep two male rabbits in the same living quarters as “friends,” then neutering is the only solution. And sometimes, though not always, they may still fight after being neutered. Many of our visitors have been enquiring as to when we’ll finally offer raw rabbit so they can raw-feed their pets. Finally, we’re happy to announce that the time is now. 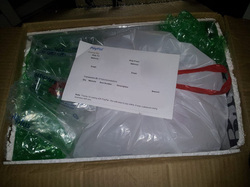 Rabbits4U is a network of small-scale commercial rabbit breeders around the United States that can ship frozen raw rabbit directly to your door. Each rabbit is individually wrapped with the weight of the contents clearly marked on the package. Ground rabbit includes bone, meat and organs, and is individually wrapped in 1-pound packages. The supplier nearest to your home will provide your order. Available is whole-prey, partially processed, and ground. Custom orders can be accommodated. Contact us with inquiries. Visit Raising-Rabbits for much more information, and to order. Your friends at Raising-Rabbits.com wish you a wonderful 2014 holiday season. Merry Christmas, Happy New Year, and enjoy your rabbits!